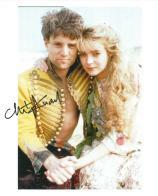 Christopher Guard (born 5 December 1953 in London) is an English actor. Educated at Latymer Upper School, Guard was a member of the National Theatre aged 20. He has appeared in Vienna 1900 (1973), Memoirs of a Survivor and Return to Treasure Island (1986). His roles are on television include the young David Copperfield in the 1966 TV serial David Copperfield, as Marcellus in the BBC adaptation of I, Claudius, as Ferdinand in the BBC Shakespeare production of The Tempest, as Ken Hodges in the medical drama Casualty and as Bellboy in the 1988 Doctor Who serial The Greatest Show in the Galaxy. He demonstrated his singing ability in the film version of Stephen Sondheim's A Little Night Music in the role of Erich Egerman. Guard voiced Frodo Baggins in the animated version of The Lord of the Rings (1978). Guard has two daughters from his first marriage with Lesley Dunlop and one daughter with actress Cathy Shipton. His brother is the former actor Dominic Guard and he is a cousin of actress Pippa Guard.